If I were Secretary of State for Energy and Climate Change, my mission would be to put us firmly on the path to zero carbon heat and electricity. Only by doing this will we meet our legally binding promise to decarbonise the UK economy and mitigate the worst effects of climate change. As you’ll see, I also wouldn’t get too hung up on where my remit officially stopped. To get back on the path, we’ll need to radically improve energy efficiency, develop our ability to shift electricity demand, enable renewables to meet the bulk of our electricity requirements, and rapidly develop our district heating market. Building design professionals are often driven by theories and ideology rather than facts. But whether we’re talking about heat networks or air-tightness, photovoltaics or passive ventilation, design decisions should be based on data, not dogma. It’s time to stop arguing, start measuring and learn from the results. When writing a recent post about the low temperature DH network at Lystrup, I contacted the author of the related technical report, Jan Thorsen. In Jan’s response he kindly included a copy of Guidelines for Low-Temperature District Heating (PDF). This guide is essential reading for designers and operators of DH systems. It shows how DH with flow temperatures of around 55 and return temps of around 25 (also called “fourth generation” or “4GDH”) can be used to serve high efficiency homes as well as buildings on low heat density networks. At this point you might say, hang on a minute – what are we doing considering 4GDH when we struggle to deliver decent 3rd generation (70/40) networks in the UK? And I’d say you’ve got a point. In fact, I spent a depressingly large chunk of last week trying to help salvage the efficiency of another new network that is horrendously oversized and was probably doomed to low efficiency before it even left the drawing board. So I’m sympathetic with the view that UK engineers need to get our houses in order before moving onto the cutting edge stuff. But looking ahead to the strategies employed in more advanced, lower temperature systems helps to highlight the design principles that we should be focusing on, even on today’s projects in the UK. We’re using our Guru smart metering and control platform to do real-time monitoring of district heating at Octavia’s flagship site in NW London. Our aim is to eliminate the two biggest risks that DH operators face: bad debt and hidden inefficiencies. Here’s an article summarising what we’re up to. Want to stay updated? Subscribe to email alerts for this blog or follow me on twitter. 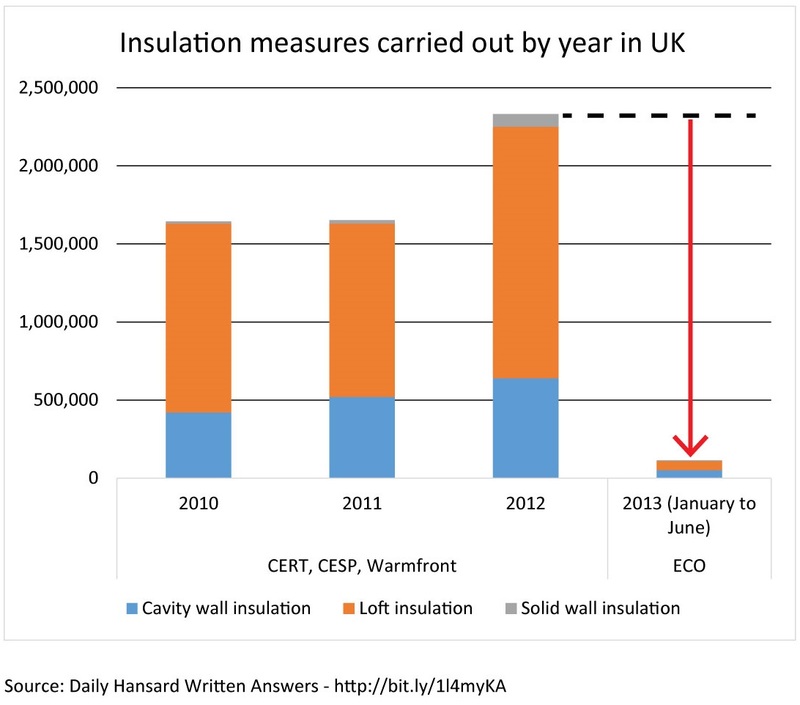 Using Greg Barker’s written response to Caroline Flint on 19 December, here’s a sickening illustration of how the current government has eviscerated the UK drive towards domestic energy efficiency. And those 2013 ECO figures are from before the government gave in to Big 6 moaning and cut the ECO targets in half! It’s difficult to imagine a government caring less about energy efficiency, emissions and fuel poverty. New nuclear will not fill the gap. It will take at least 8 years to build each new nuclear power station and the stable of new UK nukes is struggling get out of the gates – that 8 year clock hasn’t even started ticking. In a massive setback to new nuclear, last month RWE and Npower abandoned plans for two new power stations in the wake of the collapse of the German nuclear market. Without a radical change in policy, Renewables and energy storage will not grow at a sufficient rate to fill the gap. So what does that leave us? Here’s the promo video for the Sol-evo PV carport we’ve developed over the last 3 years or so. One of several reasons why this blog has suffered! I try and console myself that at least there’s a good reason.